Marcel Hirscher is the best skier in the world - eight times in a row, this Salzburg star has won the overall World Cup. In doing so, he has achieved a World Record and coup that will be hard to beat and that could stand for eternity. The winter 2018/19 was the tenth World Cup season for this thirty-year-old, who got married last year and also became a father for the first time. While a lot has changed in his private life, Marcel Hirscher once again proved an astonishing consistency on skis and delivered another impressive performance. He is an exceptional athlete and an athlete of the century. But above all, he is still someone who has "an insane amount of fun skiing", a perfectionist and winning type who always has the next race in mind. The basis for his success is his family and his homeland - SalzburgerLand. Not a winter goes by without skier Marcel Hirscher breaking records. This year, with his 67th World Cup win he was crowned as the new ÖSV record holder. Only two Athletes, Ingemar Stenmark and Lindsey Vonn, have won more victories than him. The latter has now ended her career and has just as many crystal trophies at home as Marcel Hirscher – 20 in total. Marcel Hirscher himself is reluctant to talk about chasing the records. For him, he always emphasises that it is the next victory that spurs him on and motivates him. He focusses on the next race and laying down the best of all ski runs. Every run is a run against the clock not against the competition. And the competition is big with the, often younger, athletes from Austria, Norway, Switzerland and France having to grit their teeth behind Marcel Hirscher. The 30-year-old is too good, too experienced and too much of a perfectionist. And so it was already clear this year before the official end of the season that the eighth overall World Cup victory would go again to this Salzburg skiing star. For several years now, Marcel Hirscher has deliberately treated himself to a media-free period in which he refrains from interviews, public appearances and social media presence. This is an important contribution to regenerating physically as well as mentally, to reviewing the past season and to taking himself away from the skiing circus. He also refrained from the overseas training, normal among other athletes, in order to spend all his time at home with his family and in his homeland. This summer, Marcel Hirscher will do it all again the same way. At his press conference in mid-March, he left unanswered questions about his sporting future. The summer will once again bring out his decision. Marcel Hirscher is the only skier who has ever managed to win the overall World Cup eight times in a row. Annemarie Moser-Pröll from Salzburg did it six times. Marcel Hirscher has won 20 crystal trophies to date and is thus at the same point as Lindsey Vonn. 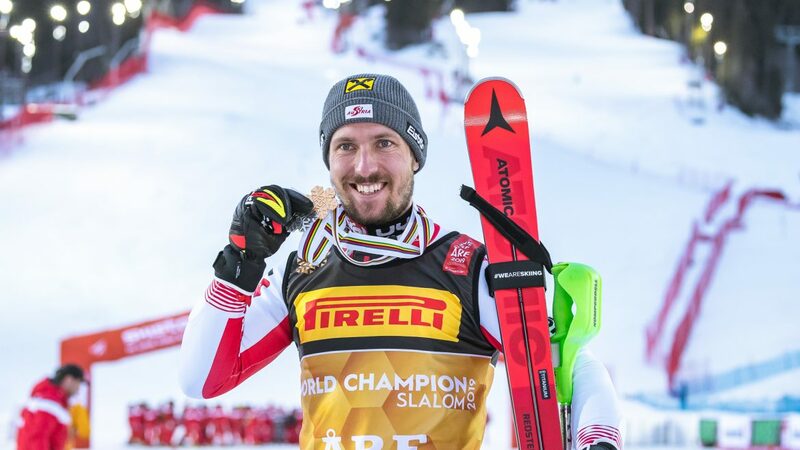 In 2018, Marcel Hirscher was named “Sportsman of the Year” for the fourth time in a row. No-one has ever won it as often. With his success, Marcel Hirscher is one of the most important role-models for Austria’s young people. 95 percent of all children and young people see this athlete as a real idol, from who to learn and to emulate. His popularity is enormous and his promotional value, too. And despite the whole hustle and bustle, Marcel Hirscher is someone who is down-to-earth and knows deep in his heart where his home is. This is why he has been an official Ambassador of SalzburgerLand for over two years. And that with full conviction. As a young child in Annaberg, he sped over the slopes of Dachstein West and spent almost his entire childhood on the idyllic Stuhlalm, where his parents managed mountain huts. “My life revolves around SalzburgerLand. It is my home and I’m not willing to leave this truly beautiful piece of the world” he said. “Marcel Hirscher in luck” – home is the best place to be! Marcel Hirscher appreciates the wide range of leisure activities on offer in SalzburgerLand, and so he will consciously enjoy it this summer together with his wife Laura and their son. Kayaking on the Lammer River and mountain climbing are at the top of his list, as well as action on his motocross bike. This Salzburger has his roots in the Lammer Valley. Here live his parents and many friends such as the Rally Dakar winner Matthias Walkner, with whom he skiied in the youth ski races. Marcel Hirscher is also present during the summer at numerous events, such as people’s runs for a good cause, kayaking events, at the Salzburg Festival or, even better at the Electric Love Festival. Marcel Hirscher likes to try new things and this often has to do with noisy engines and high speeds. A passion which, together with his sponsor Red Bull, whose headquarters are in Salzburg, is in good hands.